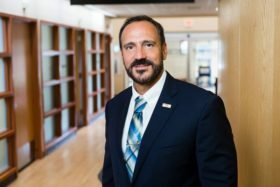 Garrett Regional Medical Center’s CEO & President, Mark Boucot, was recently invited by the Maryland Hospital Association to serve on the Council on Legislative & Regulatory Policy. The council’s role is to advocate for hospitals in Annapolis on such issues as, the opioid crisis, behavioral health services, the Certificate of Need process for hospitals to expand services, malpractice insurance reform and laws to protect healthcare workers. GRMC’s Emergency Department (ED) has seen an increase in patients presenting with psychiatric issues. A recent event the evening of September 5th required intervention from local law enforcement officials. Other examples have stemmed from long-term issues going unmet for individuals suffering from addiction, trauma, and other behavioral health concerns. The Maryland Hospital Association’s Council on Legislative & Regulatory Policy consists of 17 members from hospitals throughout Maryland. Mr. Boucot is the only member on the council that represents a rural-based hospital. The council works at the state level to advocate for legislative and regulatory policies that positively impact Maryland’s health care delivery system. In June, GRMC was awarded $600,000 by the Health and Rural Services Administration’s Rural Health Care Services Outreach Grant Program in support of a comprehensive, regional behavioral health and addictions program to be located in Garrett County. The program will launch in early 2019.